Diwali festivities are not the same as back in India. However, the Indian community in Mombasa, holds various functions to involve the Hindus during these auspicious days. Rangolis, creativity, fetes, competitions, firework displays, yummy food, poojas and havans. As soon as Navratri gets over everyone begins cleaning the house, getting sweets and savouries ready, shopping for gifts and new clothes. Every year our community Patel Samaj holds a fete. There are various food stalls and games. Most of the people, Hindus and non Hindus come for the yummy food. Papdi no lot, Kachri bateta, Bhel, pani puri, sev puri, dosa, khichdi, pav bhaji,etc. Every year new varieties are added to the list. Anyway, lets get back to the recipe. Normally for Kali chaudas which was today, we make doodh pak. This year I decided to make kheer. My daughter’s friend loves kheer and can finish bowlfuls of them in no time. When you look at him, he is a thin man, so you can be left wondering where all the kheer went! Any kheer and its his favourite. I made rice kheer with loads of nuts and fruits. Wash the rice till the water appears clear. Let it soak in water for 15 – 20 minutes. Heat ghee in a saucepan over medium heat. Add the rice and stir fry it for 1-2 minutes. Add the milk and let the rice cook in it. Keep stirring frequently so that the rice and milk do not stick to the bottom of the pan..
Let the mixture simmer till the milk quantity becomes half and the rice is cooked completely. Stir frequently and keep on scrapping the milk solids that form on the sides of the pan and put it into the simmering mixture. This will take about 20 – 25 minutes. Add sugar and raisins. Let it simmer for 3- 5 minutes. Remember to stir frequently. By now the mixture should be thick. Take the pan off the heat. Add cardamom, nutmeg powders and saffron. If you want hot kheer, add the fruits and nuts and serve. 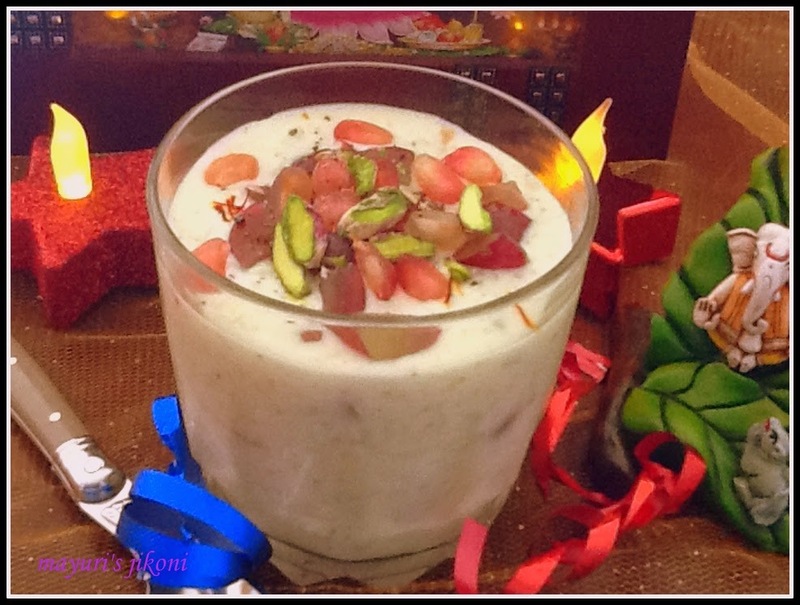 If you want to serve the kheer cold, it let cool down and then keep in the fridge till needed. Add the fruit and nuts and serve. Add sugar according to your taste. I used a mixture of almonds, walnuts, pistachios and cashew nuts. Use any other fruit of your choice like chikoo, fresh figs, berries, mango, fresh peaches, nectarines etc. If the mixture becomes too thick on cooling, add a bit more milk and mix.